Titanium Gr1 Plate/Sheet are often used for Plate/Frame Heat Exchanger. Plate and frame heat exchangers are used extensively in power plants, refineries, air conditioning systems, chemical plants, offshore platforms, surface ships and submarines. Corrosion resistance is essential in this field. The life span and dependability of titanium in this application are well documented. The initial cost of titanium in this application is not only competitive at the time of installation, but over time the life cycle costs are lower as a result of lower maintenance costs. Titanium coil and sheet consumed in this application is a commercially pure grade and products and readily available. Looking for ideal Titanium Plate/Sheet Gr1 Manufacturer & supplier ? We have a wide selection at great prices to help you get creative. All the Titanium Gr1 Plate Heat Exchanger are quality guaranteed. 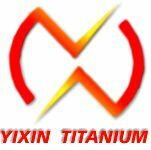 We are China Origin Factory of Commercial Pure Titanium Plate. If you have any question, please feel free to contact us.